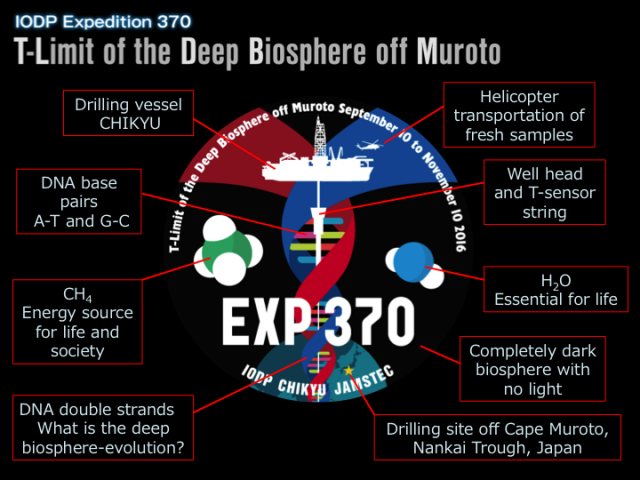 Blog posts from International Ocean Discovery Program’s (IODP) Expedition 370: T-Limit of the Deep Biosphere off Muroto. This page features blog posts from the T-Limit team. Check back regularly for updates, or read more about the expedition here. 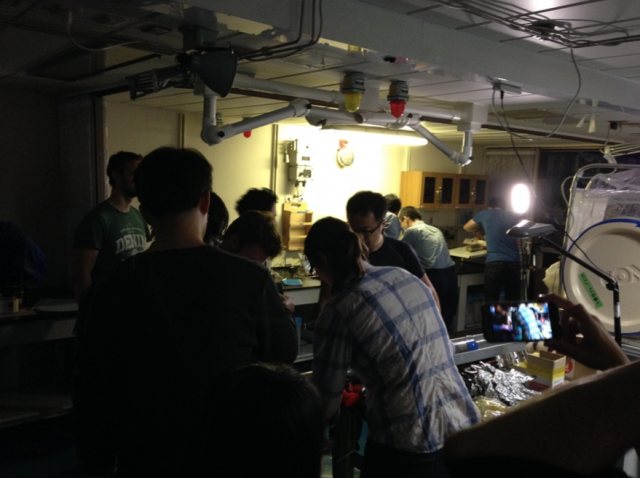 As the final core from the basement came up, shipboard scientists watched with anticipation and excitement, glad that the long hours of shipboard core processing will come to an end, but also with a bit of sadness knowing that the shipboard portion of IODP Expedition 370 is wrapping up. In the final days, we finished the final shipboard analyses and packed up. All the dirt, tools, notes, and other objects scattered around the Chikyu that were signs of our presence were gone. The Chikyu was back to the state when we first boarded and ready for the next group of scientists. Any sadness that may have been felt was quickly dashed by our first sights of land as the Chikyu headed back to port. It was our first time seeing everyday objects like trees and cars during the two months onboard the Chikyu. As we entered Kochi port, we could see the onshore team greeting us. It was the first time to see each other in person. It was exciting to finally meet the other half of the expedition scientists who we have only ever seen on a screen. 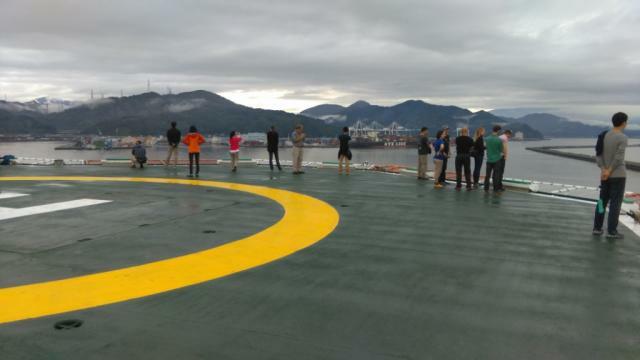 After meetings and celebrations, many shipboard scientists have returned home or gone travelling, but the T-Limit mission continued on at the Kochi Core Center with the shore-based scientists along with some shipboard scientists who stayed. Now the Chikyu is distant and gone off on its next mission. But with distance comes perspective. Even the shore-based portion of the expedition must come to a close. As the scientists all return home, they bring with them thousands of samples from this unique deep subseafloor site for investigations at their home institutions around the world. 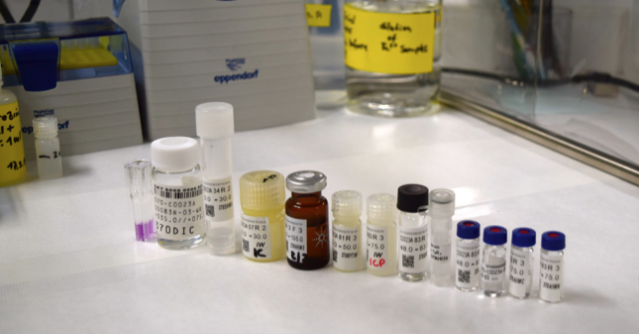 There will be many thousands of hours spent studying these samples by expedition scientists along with many other colleagues and collaborators. This is something that cannot fit into a 2-month expedition. Many discoveries and papers will emerge from this site, and we all look forward to hearing updates from our colleagues. This isn’t the end, but rather only the beginning. Donald Pan is a postdoctoral researcher in the Department of Subsurface Geobiological Analysis and Research (D-SUGAR) at JAMSTEC and a microbiologist during IODP Expedition 370. Over the course of the research mission he’ll provide more blog updates here. Questions or comments for the bloggers? Email Katie Pratt, DCO Communications Director. 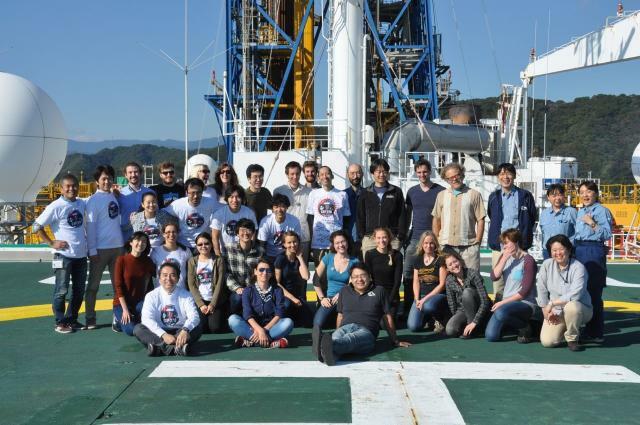 It has been 56 days since the onshore team joined IODP Expedition 370. We only have four days left to finish our onshore work! 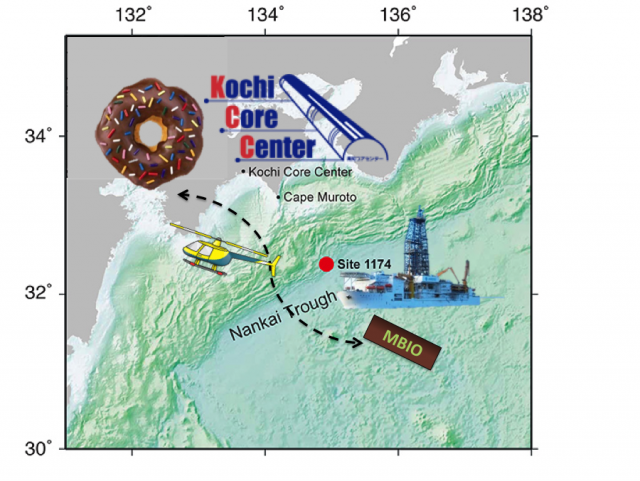 Throughout thehistory of scientific ocean drilling, this is the first expedition that includes both offshore (Chikyu) and onshore (Kochi Core Center, KCC) teams working simultaneously, facilitated by frequent sample transportations by helicopter. As a consequence, we could analyze high-quality fresh cores obtained by the Chikyu for microbiology. Why is this real-time analysis necessary? One of the scientific goals of T-Limit is to identify the high temperature limit of the subseafloor sedimentary biosphere. 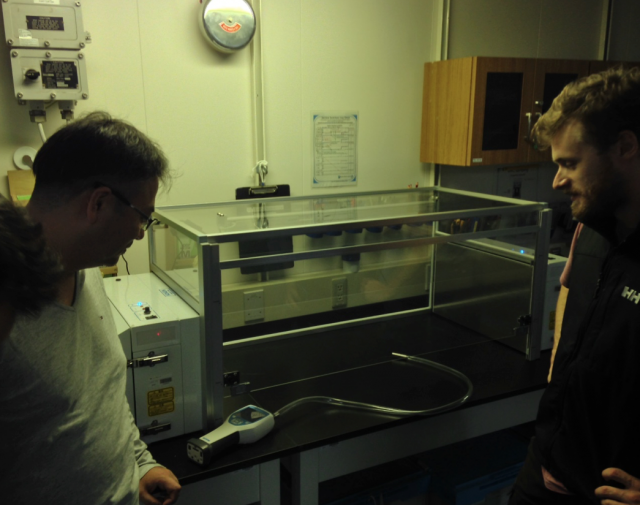 Our samples are more than 1.2 km deep sediment, with temperatures reaching ~120ºC. Therefore, we may see the bottom of the deep biosphere, where the number of microbial cells in our sample is almost zero. In order to study the low-biomass community close to the limit of Earth's habitable zone it is very important to minimize possible contaminants, such as airborne dust, hair, and experimental consumables, because it may hamper microbiological analyses. Avoiding contamination is the main reason for analyzing fresh sediment core samples here in the super-clean laboratory at KCC. The temperature gradient of the 1.2-km sediment column we obtained will cover the temperature range for mesophilic, thermophilic, and hyperthermophilic microbial life. One of our tasks in the onshore team is to assess the microbial community composition, which may shift and change according to depth and temperature conditions. Studying environmental DNA is the most powerful tool when addressing this question. During Expedition 370, we extracted DNA from cleanly prepared sediment samples, amplified DNA fragments, and sequenced. By analyzing DNA sequences, we can see if microbial communities can adapt to environmental changes during burial time, and what environmental factors, including temperature, limit the habitability of deep microbial life. This challenges the limit of currently available technologies, too. How difficult is it to study a tiny amount of DNA? Let’s assume that one microbial cell is one coffee bean, and a basketball is a mineral particle consisting of the sedimentary habitat. Extracting DNA from microbial cells in our deep and hot sediment sample is similar to brewing coffee from only 2 coffee beans in a room full of 1,000 basketballs!! It sounds really hard, doesn’t it?! During the previous expedition ODP Leg 190, almost 16 years ago, scientists found ~100,000 cells per milliliter of sediment from ~500m below the seafloor at a site near the one we drilled. During the T-Limit expedition we are studying deeper and hotter sediments containing much smaller communities. Detecting life in such extreme environments is extremely challenging and exciting to me. 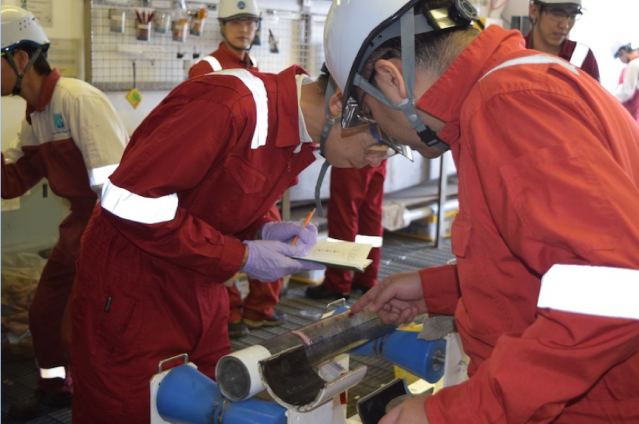 Tatsuhiko Hoshino is a member of the Geomicrobiology Group at the Kochi Institute for Core Sample Research and a shore-based microbiologist during IODP Expedition 370. D/V Chikyu arrived at the Kochi New Port at 9:00 am. The onboard and shore-based teams debriefed, and work continues at the Kochi Core Center. Check back for final wrap-up posts from the T-Limits bloggers. 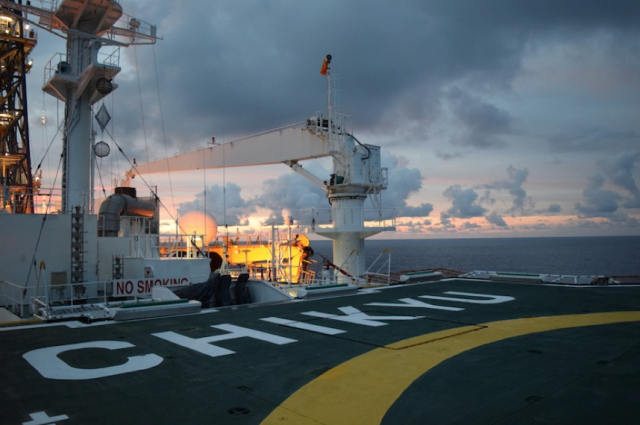 Read additional blog posts from scientists on board Chikyu here. We’ve collected over a hundred different types of sediment core samples for ship- and shore-based analyses both during the expedition and for post-cruise research. Each sample request has a very detailed description about how the material should be handled and stored. Examples range from frozen at -100°C or kept at room temperature to vacuum sealed in an aluminum bag or stored in a nitrogen flushed vial, to acidified or poisoned, stored upside down… endless possibilities for packaging on the Chikyu! Ultimately, each item will need to be carefully inventoried to ensure that everyone’s samples make it home. In other words…the joys of curation! Label 'til you drop! Inorganic geochemist Kira Homola (University of Rhode Island, USA) is ready to tackle an extensive pore water chemistry sampling campaign. Luckily, Masaru Yasunaga-san is our man. 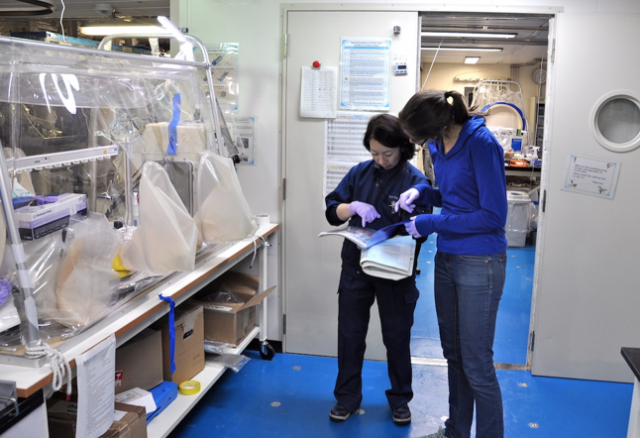 As our onboard curation specialist, Yasunaga-san set up a comprehensive sample code and storage plan for each lab on the ship and is following the flow of samples on a daily basis. He also works together with the other technicians to curate each core that comes on deck, and each core section and subsamples originating from the recovered core. Not a single cubic centimeter of core will get lost on this expedition! The curation process also involves assigning a depth, expressed in meters below seafloor, to each sample. This is a complex task as core recovery isn’t always 100%. Sometimes it’s less, as some part of the core can be lost during coring operations or during the core recovery process (sad news). Other times it’s more, when a longer core than expected makes it on deck. This sounds like it violates general mass balance principles, however, this discrepancy can easily be explained by expansion or stretching of the core on its way up from the seafloor. When core recovery is around 100%, it’s a good day on the Chikyu! A round of pore water aliquots that have emerged from one sediment sample in the inorganic geochemistry lab. The inorganic geochemistry team extracts pore water from the sediment before performing an extensive suite of chemical analyses. The technical team rotates every four weeks on the Chikyu. Some fresh blood means Shigako Nigi-san has taken over. 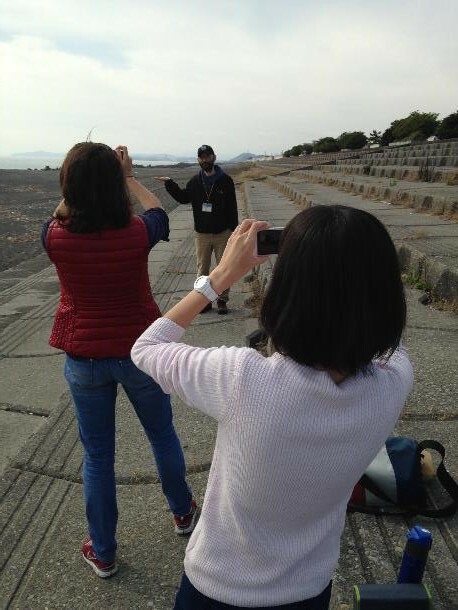 While waiting for new cores during casing installation, curator Nigi-san and her team go through the hundreds of different sample codes and thousands of samples, on the hunt for any discrepancies. Samples also are transferred to “outside” storage units to relieve the stress on our overflowing freezers. Curator Nigi-san and microbiologist Majia Raudsepp (University of Queensland, Australia) going over the 40-something different sample types collected in the microbiology lab. No confusion allowed! Any material not earmarked for a specific scientific project will be archived at the Kochi Core Center. Scientists around the world can then request archived sample material for decades to come. This is one of the beauties of the International Ocean Discovery Program, fostering scientific discovery throughout the community. 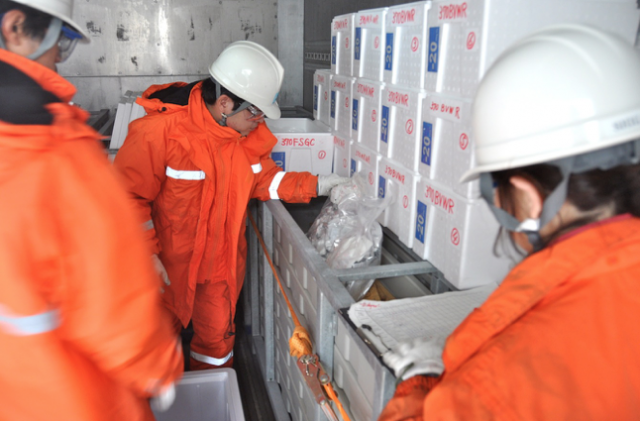 Laboratory technicians transferring samples to the -20°C container. 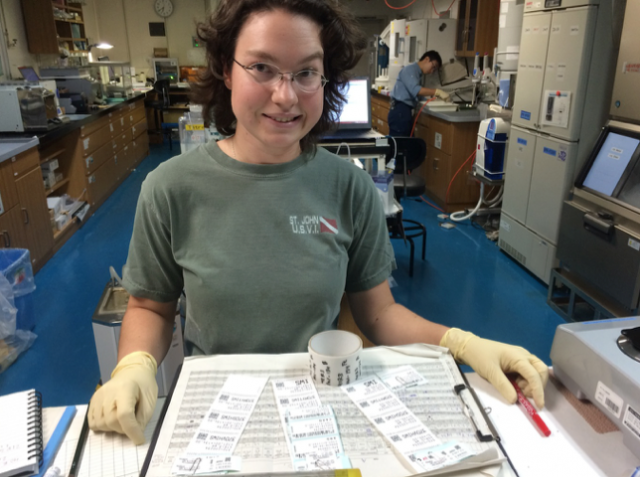 Justine Sauvage is a graduate student at the University of Rhode Island Graduate School of Oceanography and an inorganic geochemist during IODP Expedition 370. Over the course of the research mission, she’ll provide more blog updates here. IODP Expedition 370 introduces a new feature to the history of scientific ocean drilling: a simultaneous interplay between the scientific expedition onboard D/V Chikyu and shore-based microbiological work at the Kochi Core Center (KCC) using super-clean facilities. 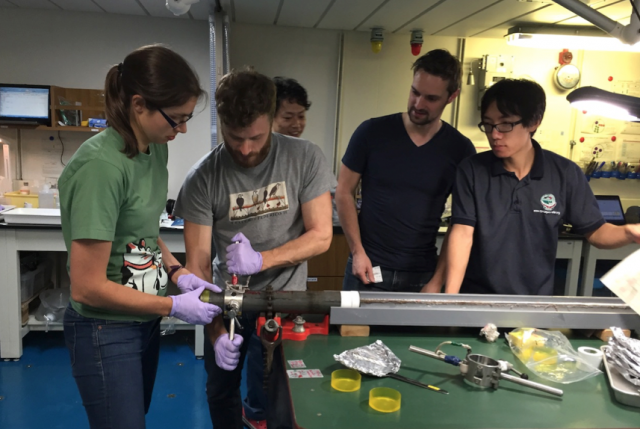 Usually, most of the scientific activities take place onboard the drill ship; however, to meet the objectives of IODP Expedition 370 requires using very specific technologies in a timely manner. These technologies include Kochi’s super-clean lab spaces (i.e. 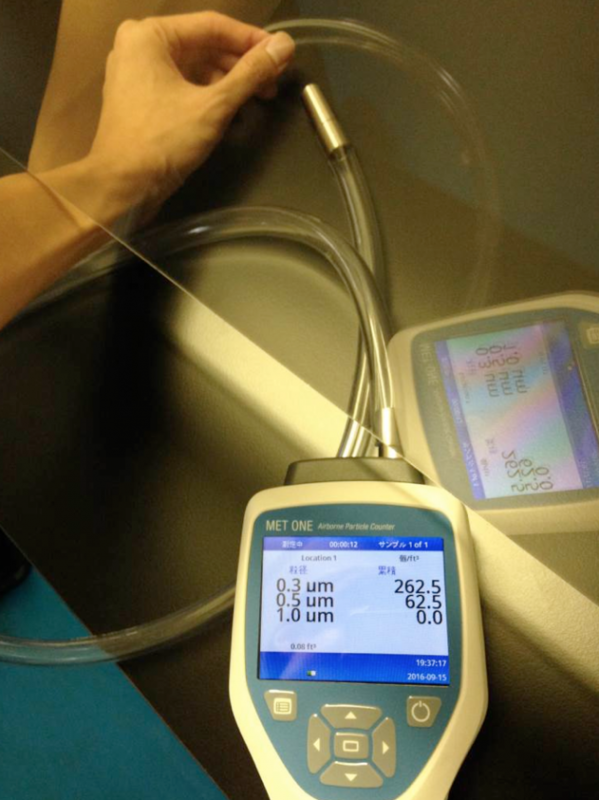 low air particle count, see Donald’s previous post below), instrumentation to separate microbial cells from the sediment matrix to perform high precision cell counts, next generation sequencing technology, etc. Luckily, the KCC is within helicopter reach from our study site (approx. 180 km away), making simultaneous shore-based work possible. 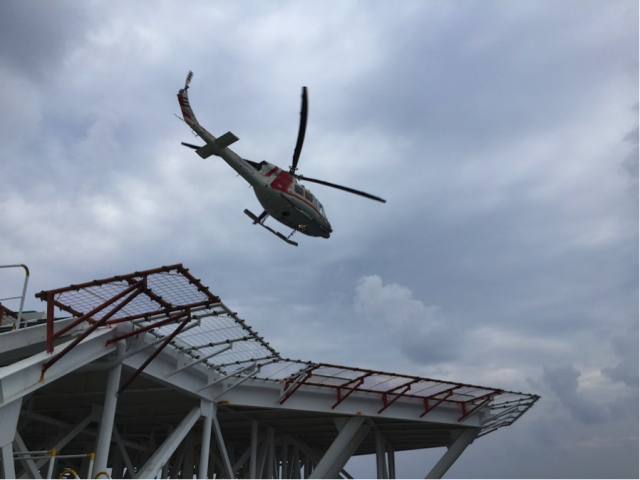 Regularly, helicopters shuttle freshly recovered “MBIO” (short for microbiological) samples from the ship to Kochi, where a team of five shore-based scientists, led by co-chief scientist Yuki Morono, processes the samples. Both ship and shore-based teams occasionally meet on conference calls, when major science updates take place. This morning we were happily surprised with a fresh donut delivery from the Center for Deep-Earth Exploration (or CDEX, management department of the D/V Chikyu), which was extremely well received onboard! After a month at sea, we start missing some food items…the donuts made it all good somehow! The KCC- D/V Chikyu MBIO trade route. Map courtesy of the JAMSTEC press release about IODP Expedition 370. Meanwhile, the team in Kochi is setting up sophisticated incubation experiments using the received core samples. Incubators are little breeding vessels for microbes and some were uniquely designed for this expedition to investigate microbial metabolic activity within the deep, hot Nankai trough sediment. By placing a sediment sub-sample within these high-pressure and high-temperature incubators, we will be able to monitor the behavior of microbiological communities over long periods of time and study how they respond to specific changes in the geochemical environment (e.g., spike the incubator with hydrogen, methane, or other carbon or energy source). These fundamental experiments will change our understanding of how microbes make a living in these dark, high-temperature, high-pressure, and low-energy deep subseafloor environments. To set up these experiments, we need to know what the conditions (pressure, temperature, chemistry) are in the seafloor. Knowing these factors means the shore-based team can parameterize an incubator to match in situ conditions and create “feel good” vibes for microbes (i.e., provide enough energy). We use physical and chemical data measured onboard to inform the incubator set up, emphasizing the close interplay between the shore-based and ship-based work. Geochemist and shore-based team member Akira Iljiri has sailed on many IODP expeditions before and is dearly missed among the scientists who had the pleasure to sail with him before. To compensate, co-DCO blogger Stephen Bowden improvised some mini Akira-San frames to spread all over the lab. Both teams will meet up at the end of the expedition when Chikyu gets to port in Kochi. Helicopter leaving D/V Chikyu loaded with precious MBIO samples. Co-chief Yuki Morono and Shore-based geochemist Akira Iljiri setting up different incubators at the Kochi Core Center. DCO-blogger Stephen Bowden and one of his (many) Akira-san frames. Ten years ago, I was involved in astrobiology related projects as an undergrad REU (Research Experience for Undergraduates) intern in Dr. Richard Quinn's lab at the NASA Ames Research Center and SETI Institute. It was a life-changing experience and helped jumpstart my scientific career. Even now, I still make connections to what I learned during my time there as an intern. 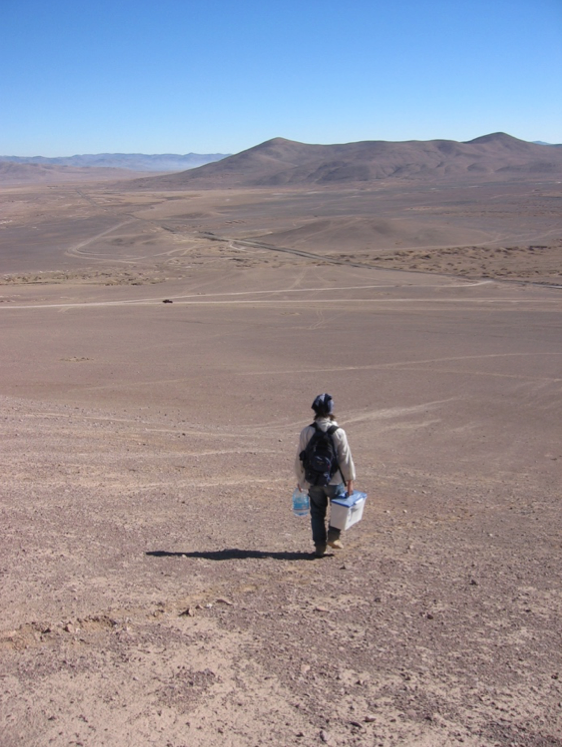 We repeated legacy NASA life-detection experiments in the Atacama Desert in Chile, a desert so dry and low in organic matter that life was thought undetectable by NASA’s Viking Lander experiments. But even there, we were able to find life everywhere we looked. Even in the driest desert, life still survives on the surface of planet Earth. Recent IODP discoveries showed life exists 2.5km below the seafloor. However, we do not know how far into the subsurface life continues to thrive. The Chikyu is currently drilling into sediments in the Nankai Trough that gradually become hotter and hotter with depth. The sediments may reach 120°C when at the basement rock, 1.2km below the seafloor. We currently don’t know whether subsurface life can cope with such high temperatures while starving for energy. Will we find a lifeless environment here, or is life everywhere we look on Earth? The beautiful Nankai Trough, somewhere 4765m below this photo. We do not know if there is life on Mars, Europa or in the hot sediments of the Nankai Trough. 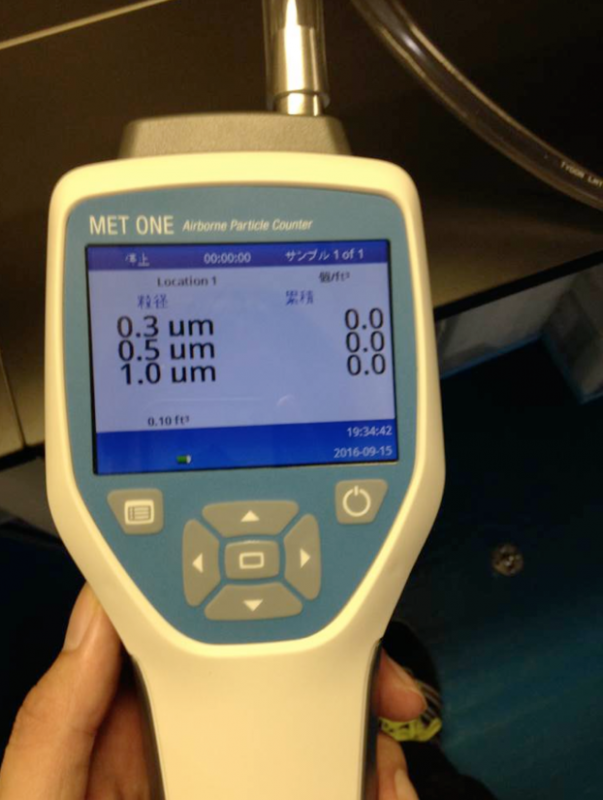 Fortunately, recent technical achievements at JAMSTEC’s Kochi Core Center allow us to detect even a few cells per cubic centimeter of sediment. One of the challenges of the search for life in potentially lifeless regions is that if we happen to find it, how do we know that it wasn't something we brought with us? Was it just a hitchhiker that rode on a spacecraft from Earth? Likewise, if we find cells at 1km below the seafloor, how do we know they didn’t come from the surface? One solution for the search for life on other planets is to try to decontaminate spacecraft as much as possible. But for scientific drilling, it is impossible to sterilize everything because the surface of Earth is covered with microorganisms. That’s why when we drill for biology, using contamination tracers in the drilling fluid is essential. Some common strategies include using plastic beads that are a similar size to bacteria, as well as chemical tracers, both of which track the possible movement of drilling contaminants into sediment cores. The tracer we are using on this expedition is perfluoromethylcyclohexane (PFC), which we detect by gas chromatography. 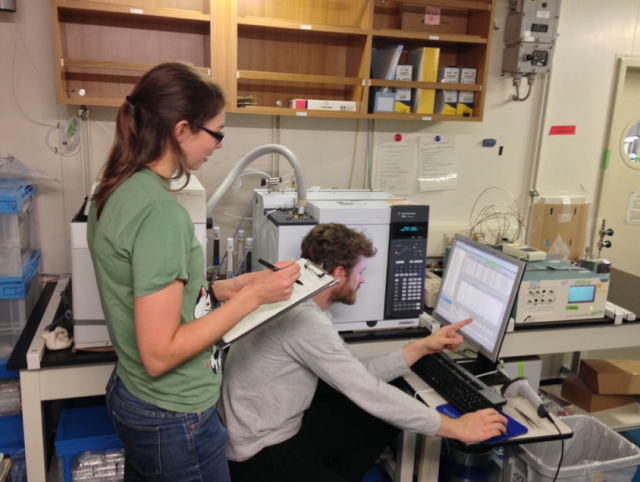 Shipboard microbiologists Maija Raudsepp (left; University of Queensland, Australia) and Lorenzo Lagostina (right; ETH Zürich, Switzerland) scan gas chromatograms for signs of perfluoromethylcyclohexane. During the expedition, the shipboard microbiology team has been keeping track of infiltration of the PFC tracer into the cores so that we can assess the quality of our cores. 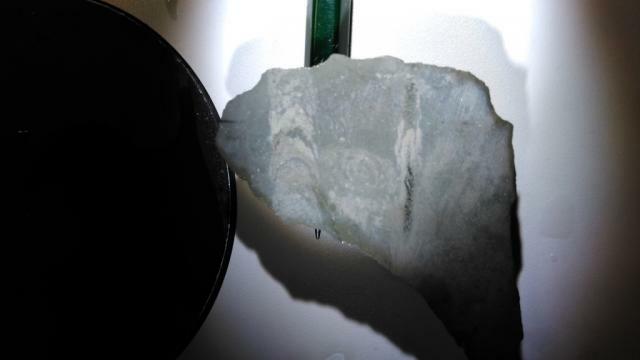 Absence of tracer confirms that samples have not been in contact with drill fluids in the borehole. In this way, we can be confident that what we find is truly life from the deep, hot subsurface. It takes more than a typhoon, power outage, and seasickness to stop Expedition 370. The deep subseafloor (not the sky!) is the limit! Week three of our expedition has concluded. Our status: we have cored through several hundred meters of sediment and are now approaching the Empire of the Hyperthermofiles (i.e. organisms that thrive in extremely hot environments). It’s getting hot down there, which means we are getting closer to our T-limit of life quest. The first sets of cores of the expedition were retrieved using different piston coring technologies. The first technique basically hydraulically fires a heavy steal tube into the formation (the word we use to describe this area of seafloor) to extract a core of sediment. The deeper we get into the formation, the harder it is to recover high quality cores using this technology. 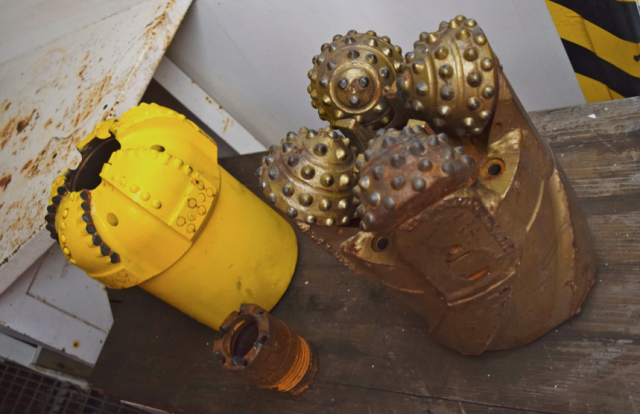 A collection of different drill bits onboard D/V Chikyu. That’s when the big guns come out: Rotary Coring Barrel or RCB, which is composed of a drill pipe connected to a drill bit at its bottom end. The drill bit we are using has a diamond crystal coating that crushes through the formation like butter. RCB delivers up to 9.5 m cores on every three to four hours, which is announced each time by a pretty glorious “Core on Deck” ship-wide PA notification. 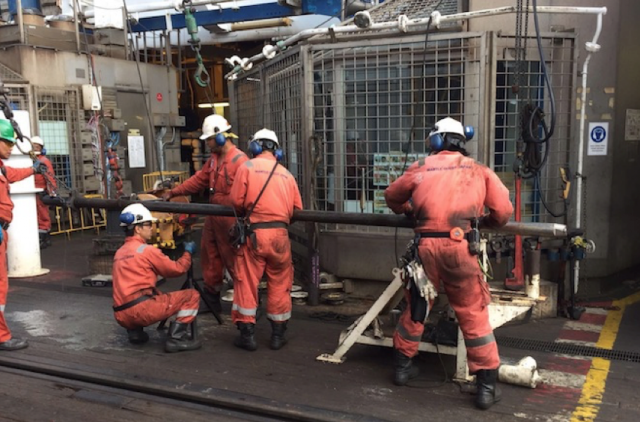 Coring engineers retrieve the core from the core barrel on the rig floor (photo courtesy of HSEQ officer). Once the core (anywhere between 0-10 meters long) has been retrieved from the core barrel on the rig floor it is brought to the so-called “core cutting area” (see Stephen’s previous post), where co-chiefs and sedimentologists get their very first look at the core through the transparent core liner. Core recovery and coring disturbance is assessed, and some striking core features like gas voids, fractures, ash layers, or major lithological changes (i.e. physical characteristics of the sediment) are identified. Gas sampling for methane and hydrogen happens right away, as these compounds readily “degas” when brought from deep depths to atmospheric pressure. 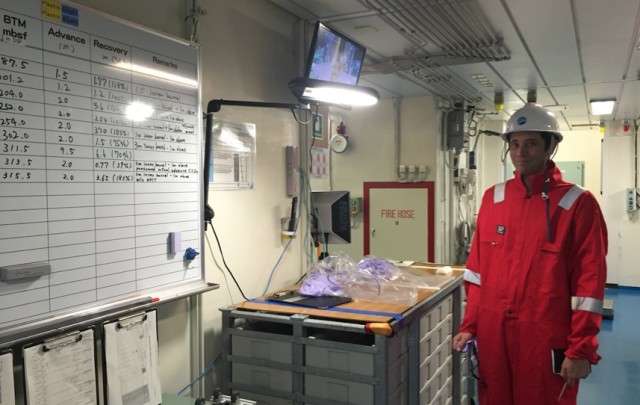 Sedimentologist Stephen Bowden (University of Aberdeen, UK) in full PPE (personal protective equipment) attire following the “Core on Deck” announcement, getting ready to examine the freshly recovered core. 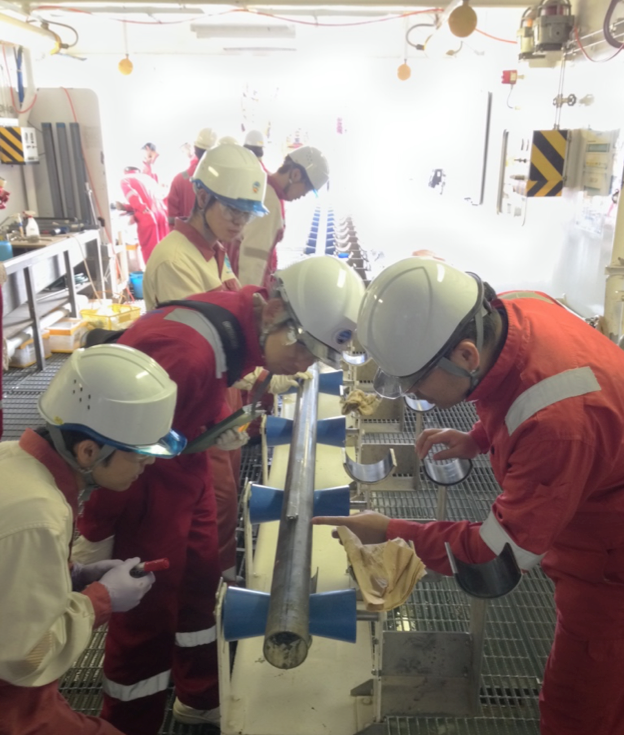 Co-chief Fumio Inagaki (JAMSTEC, Japan) and Shikoku basin geology expert Satoshi Tonai (University of Kochi, Japan) inspect the core immediately following its recovery. Following first core observations and sampling, the core is cut into more manageable 1.4 meter long sections and brought to the Core Processing Deck, where it is taken to the CT scanner. This instrument is just like the CT scanners in your local hospital or clinic, however, we’re not interested in broken bones but what the cores look like from the inside out! 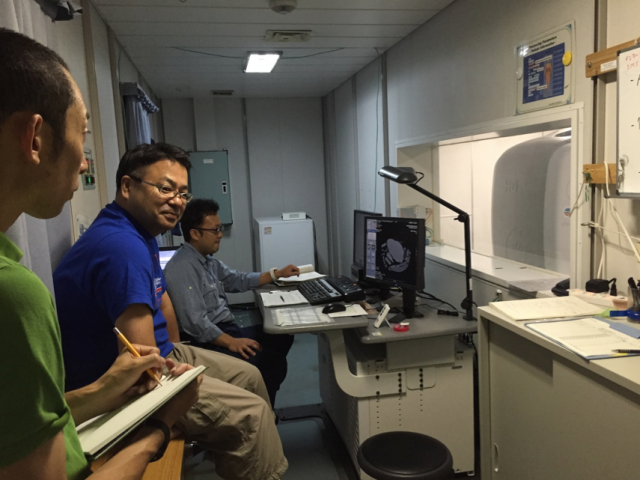 Co-chief Fumio Inagaki (JAMSTEC, Japan), sedimentologist Satoshi Tonai (University of Kochi, Japan) and CT scan specialist carefully following the generation of CT images of the new core. Decision on how to allocate the core in the making! Section by section, the CT scanner reveals the cores’ lithological secrets instantaneously! Variations in the density of the core material are highlighted in shades of grey, with fractures and micro-fissures becoming very obvious, allowing us to visualize the overall structure of the core. This is extremely important information, which helps the co-chiefs decide which parts of the core are allocated to the different science teams. For example, a pristine-looking part of the core, with no signs of cracks or micro-fissures is prime material for microbiological and geochemical work because it is unlikely to have been contaminated during coring. Once the co-chiefs decide on a sample allocation plan, a microbiologist chops the core into smaller pieces and the entire science team sets to work. More on what follows in a later post. Microbiologists Maija Raudsepp (University of Queensland, Australia) and Lorenzo Langostina (ETH Zürich, Switzerland) cutting the core into a few tens of centimeters subsamples for processing by the different science teams. Besides the cyclic “Core on Deck” PA announcements, there are a few other daily highlights worth mentioning as we approach day 23 aboard the Chikyu. At the top of the list is, without doubt, “Sunrise or sunset O’clock (depending which shift you’re on). Right before dinner, if the cloud cover doesn’t ruin the show, we (the day shift science team) often gather for a little escapade to the helideck to watch the sun go down and catch some fresh air. 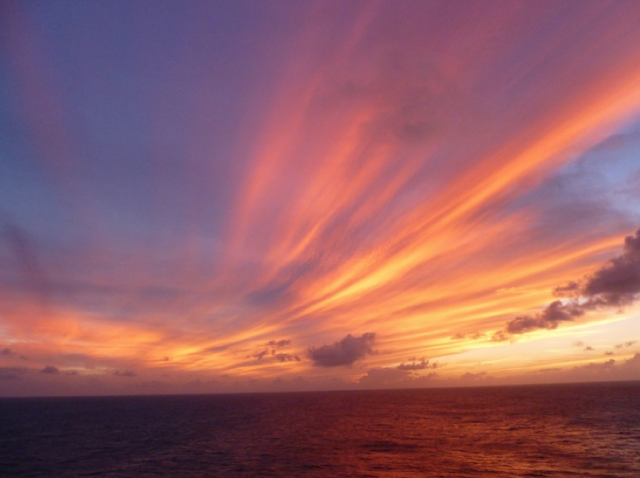 The Pacific + sunset + illuminated derrick + the occasional flying fish = a guaranteed hit! Sunset Part 2: “Intermezzo.” (From left: Microbiologist Maija Raudsepp (University of Queensland, Australia), Organic Chemist Hayley Manners (University of Southampton, UK), Physical Properties Scientists Nana Kamiya (Nihon University, Japan) and Susann Henkel (AWI/MARUM, Germany), and Inorganic Geochemist Justine Sauvage. 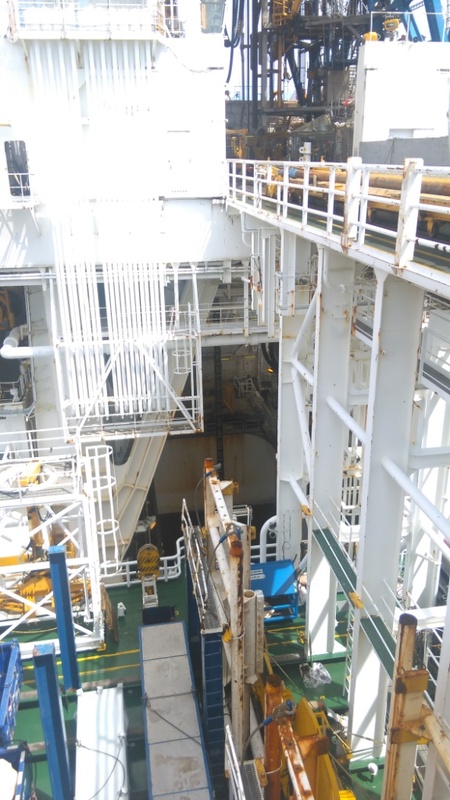 The animated GIF below shows the business of a core’s arriving on deck and subsequently being processed. It is busy. In the sequence, viewers can see different elements of the expedition—the chiefs, the operations geologists, the Chikyu’s laboratory crew, and the scientists. Like bees to flowers, or burrowing organisms emerging from the seafloor for food, everybody emerges for core. The frenzy is real as the core is processed. Then there is quiet. People go back down below. With all of this moving up, then moving back down below, my sedimentologist colleagues and I have a lot of empathy with the life habit of some of the trace fossils we have found made by burrowing worms that briefly break the surface then go back down below. 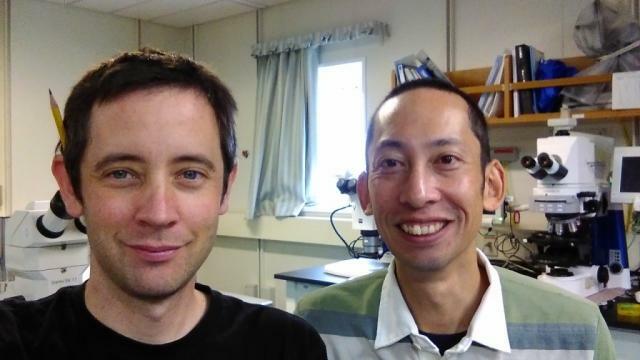 Stephen Bowden (left) with T-Limit sedimentologist Satoshi Tonai (Kochi University, Japan). Below is an image of a zoophycos burrow, preserved within a carbonate-cemented concretion. Ichnofossils like this are good for constraining early diagenetic stages experienced by sedimentary organic matter. How organic carbon is buried within rocks depends on their early depositional environment. Zoophycos, for example, is an indicator of sediments that were at least intermittently oxygenated enough for animal life. This suggests that some of the sediments preserved their organic carbon only after exposure to oxygenated conditions. Normally, organic carbon is less well preserved when it accumulates in oxygenated environments. This geological observation is something that we can support with additional measurements that will be made later in the core processing lifecycle. A good geology link for more information on Ichnofossils is here. 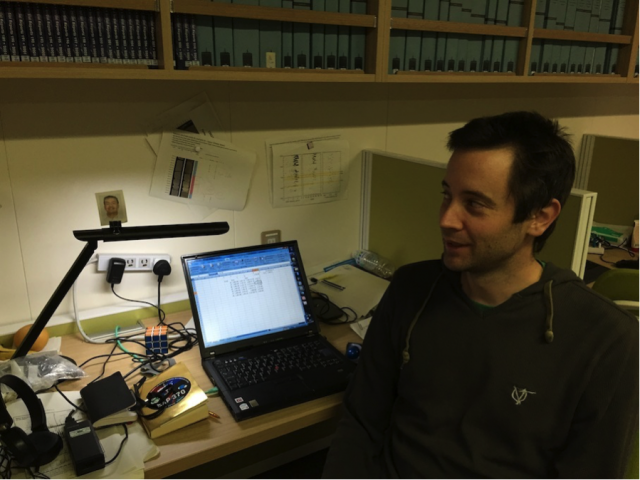 Stephen Bowden is lecturer in organic geochemistry at the University of Aberdeen and a sedimentologist during IODP Expedition 370. Over the course of the research mission he’ll provide more blog updates here. 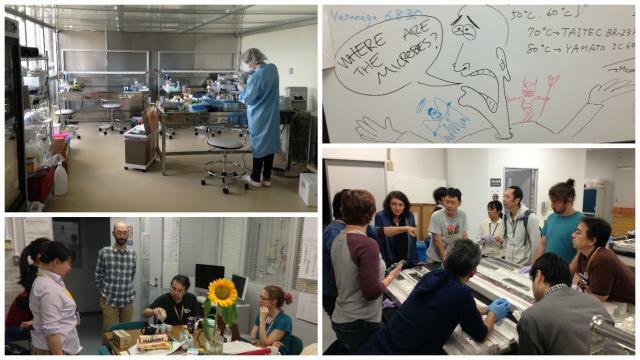 One of our first tasks was deciding how to organize our core-processing workflow to make sure we don't introduce surface microorganisms into precious subsurface samples. Even shipboard air is a concern, so we walked around and measured particle levels in the air aboard the Chikyu. The shipboard microbiology lab in preparation. 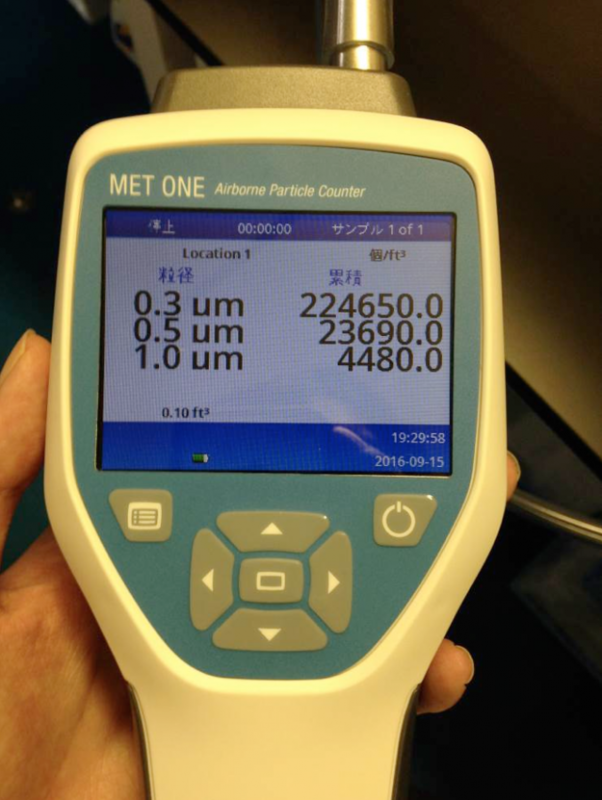 Many of these airborne particles may be cells and viruses, which can unfortunately easily contaminate our precious core samples. Typical bacterial cells are around 1.0um while cells from the deep subsurface are around 0.5um. At 0.3um, particles are starting to approach the sizes of viruses. A quick survey of shipboard air shows how many particles are floating around on the Chikyu. The super clean room at Kochi Core Center. 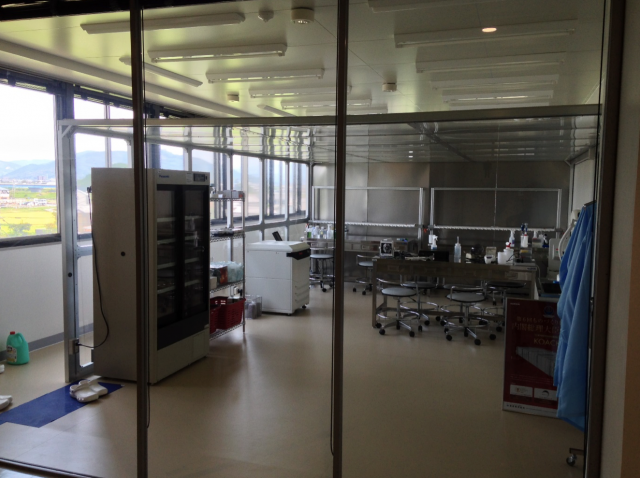 The super clean room also has great views of the Shikoku countryside. 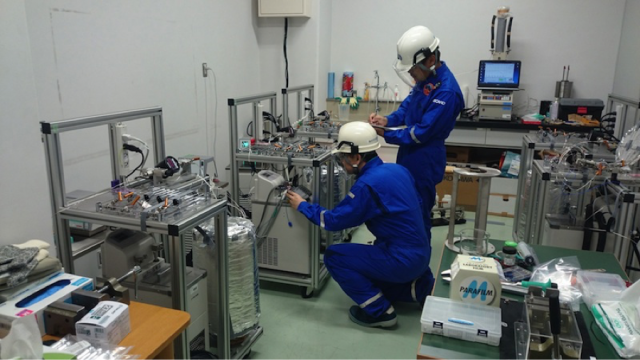 To minimize opportunities for contamination onboard the Chikyu, the Kochi Core Center provided a miniature version of its super-cleanroom using the same principles that were used to build the Kochi super clean room. We gave the miniature version a try onboard. Co-chief and shipboard microbiologists in dramatic anticipation. Happily, we confirmed that our onboard, “benchtop" version of the Kochi Core Center super clean room is comparable its counterpart on land when using the same device to measure air quality. By processing cores inside the benchtop super clean room, we can avoid major sources of contamination that come with processing cores onboard research ships. Bonus note regarding life aboard the Chikyu: Every year my family celebrates mid-autumn festival, which occurred on 15 September this year. We celebrate by appreciating the full moon and eating special cakes called mooncakes. But since I'm at sea, there isn’t really a way to fish for mooncakes from the ocean. 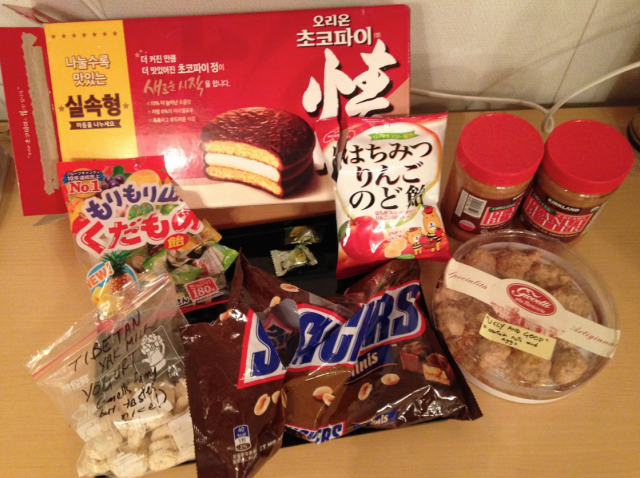 Fortunately a shipboard sedimentologist brought some Choco-pies from Korea. They were a big hit among the shipboard scientists including myself. Not exactly a mooncake, but sometimes you have to improvise when doing field research. Preferred electron donors among shipboard scientists. Choco-pies in the red box. In the meantime, I promised to explain why I thought this expedition was so useful for applied petroleum geologists. I will do my best here to give it a go. The deep biosphere is an important influence on the character of petroleum in several respects. Underground biological activity can remove some petroleum components, leaving behind less valuable hydrocarbons. The classic example of this is large Tar Sand deposits. This gigantic oil accumulation was once all conventional oil, until microbial activity reprocessed it to crate heavy oil. Tar Sand deposits like this are shallow, but many more conventional, deep oil fields are influenced by similar processes. Heavy oil deposits are what they are as a result of subsurface microbial activity. The deep biosphere also impacts natural gas accumulations. Deep microbes can generate methane through their metabolic activities, and many gas provenances have at least some microbially generated methane. A number of examples of this are found in Russia. At least some of the gas in these gigantic gas fields was generated by subsurface microbial activity.<li>http://pgc.lyellcollection.org/content/7/659.abstract</li>. Finally, microbial activity can also generate hydrogen sulphide and produce some of the organic acids found in petroleum. These compounds change how oil is produced and sold, and have other impacts besides. For example, hydrogen sulphide is a major health and safety consideration. Hydrogen sulphide is a poisonous gas, and the deep biosphere produces a lot of it. Both releases from lake-sediments and the deep subsurface can be catastrophic. So the deep biosphere also impacts things at the surface. I used the terms microbes and biosphere above without being very specific. In fact, these varied microbial processes require different environmental conditions, which IODP 370 will give us an opportunity to better understand these environments. Using the latest scientific drilling and core-analysis technology, we will be able to accurately record microbial processes. And, most importantly, we expect to accurately reach the temperature limit for microbial life below the seafloor on this expedition. DCO has an anonymous poll, what do you think is the temperature limit for subsurface microbial life? The petroleum industry has plenty of opinions on this subject, so please vote. It would be great to have lots of data for this. To be clear, your vote does not decide the limit, but only indicates what you think the limit might be. Here it is, the Integrated Ocean Discovery Program can add a new site to its collection: Site C00023, the target of IODP Expedition 370 is on the map! Last Friday, around 8 am, Expedition 370 scientists watched with great excitement as the drill bit undulated above the seafloor for a little while until finally “spudding” into the sediment. 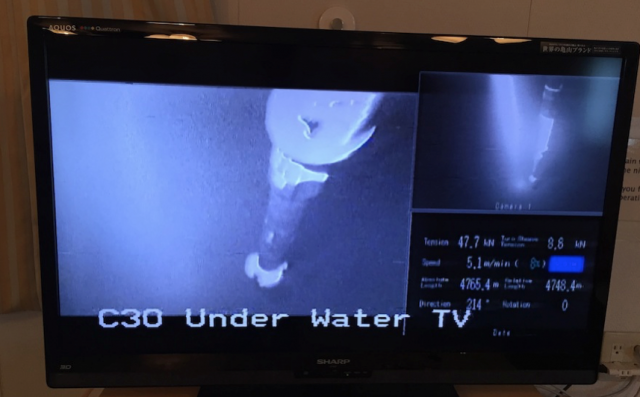 Underwater camera showing real time spudding of Hole C0023A. The first step in designing a stable and relatively deep well in a geologically complex setting, like the one we are working in, is to place casing. Drilling engineers placed a 20-inch wide casing in the first 180 meters below the seafloor to ensure that the hole won’t collapse on itself as we core deeper. As I write this, the coring assembly is being lowered one drill pipe at the time until the seafloor is reached and the hole can be re-entered. The start of the coring operations is imminent! Some scientists dream about precious sediment/rock samples coming back from Mars, or other remote worlds, decades from now. We dream about the first core of our expedition coming on deck ***tomorrow***. This means that the entire flow of activities from core recovery, to sample allocation, to laboratory analysis, needs to be carefully orchestrated, so once the core is on deck operations can happen in a smooth and efficient manner. Being part of the inorganic chemistry team, our main responsibility involves squeezing (pore) water out of the sediment and analyzing its chemistry. This will rapidly become a challenge because the deeper we core the harder the sediment gets, making it difficult to extract much water out of it. 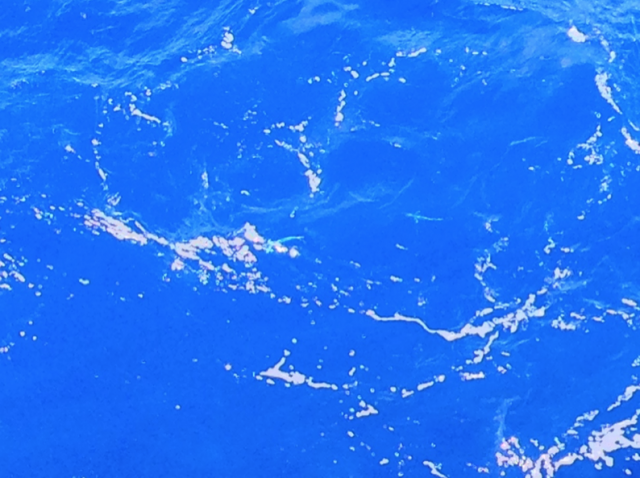 Porewater is a rare commodity in oceanographic research and many shipboard and shored-based scientists hope to use some of it to meet the expedition’s objectives. To be best prepared for what’s ahead, today we designed a detailed “drop-by-drop porewater allocation plan” (i.e. based on a certain volume of recovered water - from very large to tear drop sized -, what set of chemical analyses can we carry out?). This exercise is tricky but essential to the success of this expedition. 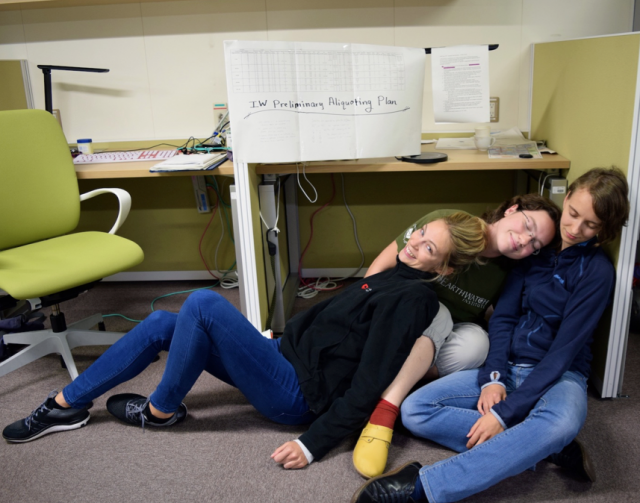 Inorganic geochemists (from left to right: Justine Sauvage, Kira Homola (University of Rhode Island, USA), and Susann Henkel (Alfred Wegener Institut, Germany)) tired after the set up of a detailed porewater allocation plan. We printed and hung the plan on the lead inorganic geochemist’s (Arthur Spivack (University of Rhode Island, USA)) desk to surprise him at the start of his shift. Keeping the spirit high among the team! 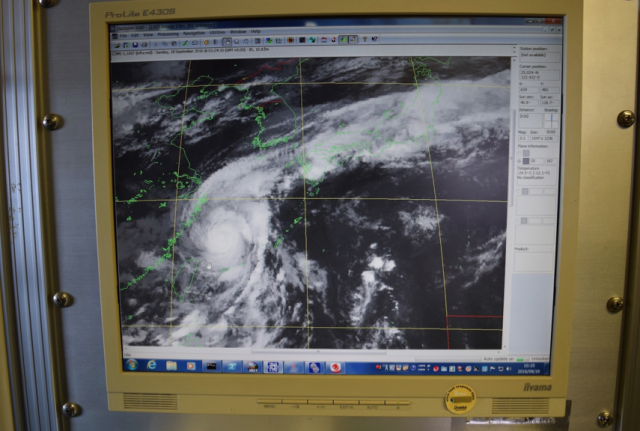 To keep activities onboard Chikyu even more exciting: Typhoon Malakas is on its way. We expect to experience the aftermath of the typhoon shortly after the recovery of the first core. We hope to finalize the bulk of coring operations and core processing before the storm. In other words, no time to lose! Satellite image of Typhoon Malakas displayed on Chikyu’s bridge. We expect to experience some of it two to three days from now. Bon Voyage! IODP Expedition 370, here we finally are! I’m a graduate student at the University of Rhode Island Graduate School of Oceanography and will be blogging for the Deep Carbon Observatory to report some of the interesting and exciting hard-core (or should I say hard-sediment) science ahead of us. I will be sailing as an inorganic geochemist on this expedition and couldn’t be more thrilled to be at the forefront of scientific discovery on Earth’s largest scientific drilling vessel, the D/V Chikyu, for the next few months. 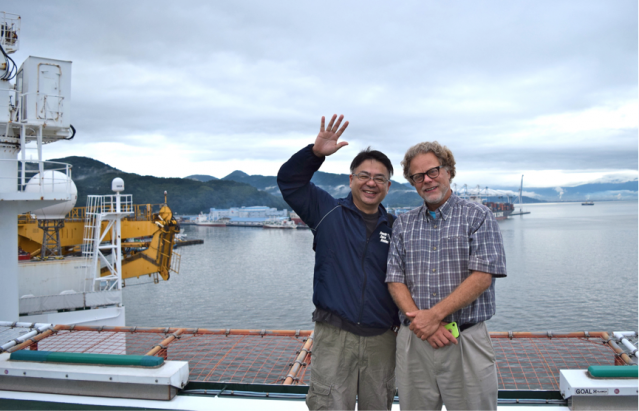 Co-chief scientist Fumio Inagaki (JAMSTEC, Japan) and Arthur Spivack (lead inorganic geochemist, URI, USA) on Chikyu’s helideck during the ship port departure. Prior to departure, one can’t forget a key IODP tradition: an extensive and festive farewell diner in the departure port, in this case Shimizu, about 2 hours southwest of Tokyo and in the vicinity of Mount Fuji (scenic ports are key in oceanographic research!). 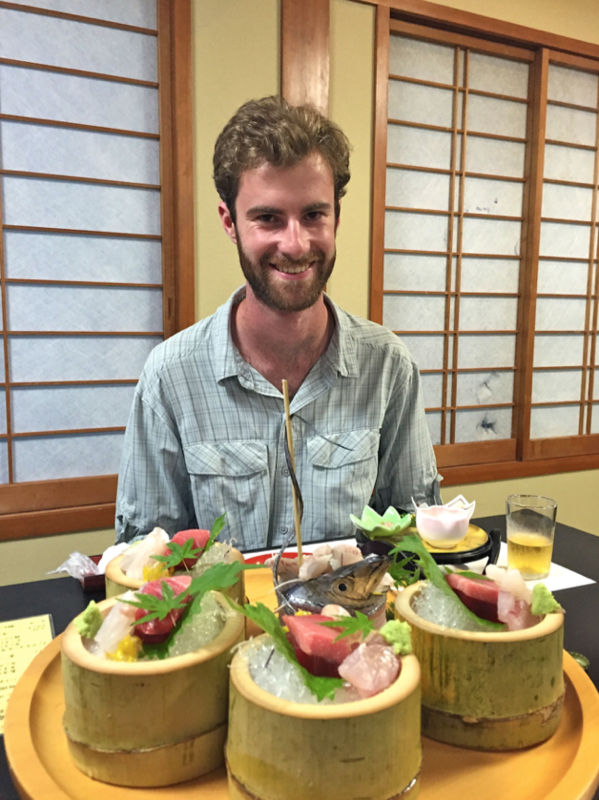 Our Expedition Project Manager organized a lovely diner where a wide variety of traditional Japanese dishes (or more precisely Metropolitan Museum of Art worthy mini dishes loaded with Japanese delicacies) were served. To ensure that the sea gods will be on our side during the expedition, our leaders blessed the expedition with different local Sakes. 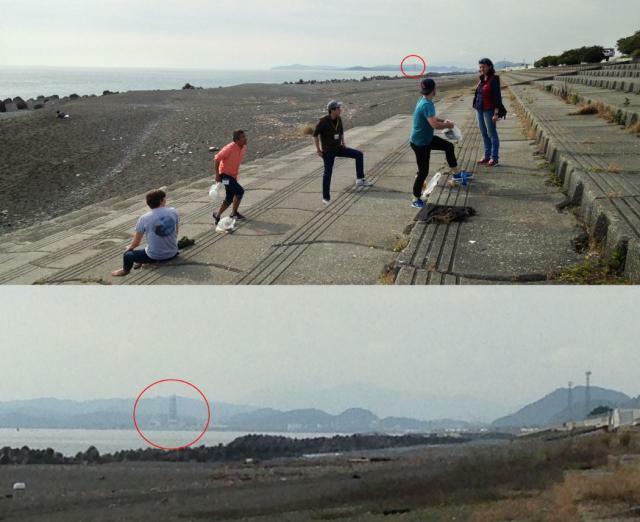 The ship departed Shimizu port on September 13th at 9 am and started its 400km voyage southwest to the Nankai Trough. Once onboard, things got serious very quickly. 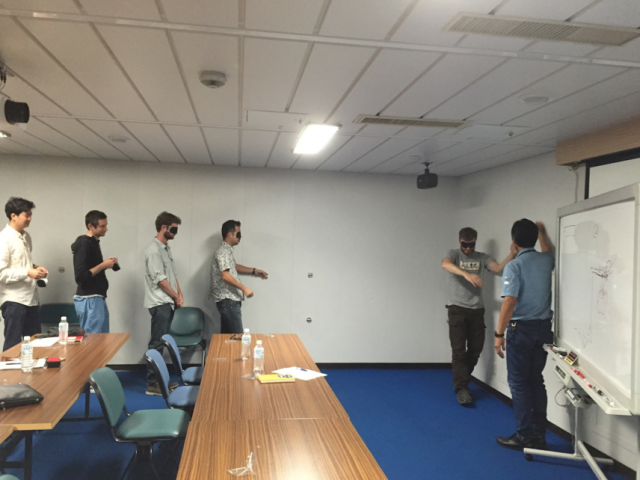 We started with a variety of ship inductions and safety briefings (safety first! ), followed by a dive into the matter at hand: Science. The expedition’s main objective is to look for the potential presence of a T(emperature)-limit for subseafloor microbial life. We will be drilling through one of Earth’s most tectonically active regions, the Nankai Trough, where temperatures increase sharply with depth, reaching approximately 130°C, where the sediment transitions to rock. From theoretical considerations, laboratory experiments, and limited environmental evidence, we believe such a T-threshold of life will be crossed at the expedition site. The nature of this threshold (e.g. abrupt or smooth transition to an abiotic world) is a mystery. If successful, such a discovery will tremendously increase our understanding of these remote and extreme subseafloor sedimentary environments and how life thrives in them. A group of 31 scientists from different backgrounds will contribute to this effort, forming a solid and international power team! From left to right: Kiho Yang (sedimentologist, Yonsei University, Korea), Stephen Bowden (sedimentologist, University of Aberdeen UK, and DCO blogger), Kyle Metcalfe (microbiologist, Caltech, USA), Hiroyuki Imachi (microbiologist, JAMSTEC, Japan) and Lorenzo Lagostina (microbiologist, ETH Zürich, Switzerland) receive training on escaping in case of a blackout. 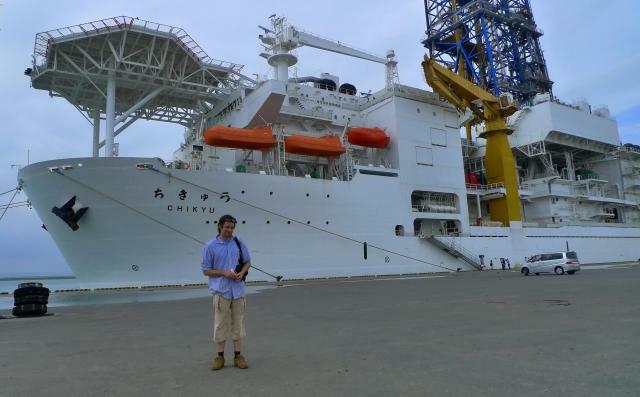 The D/V Chikyu and I met in 2012, when I was participating in my first IODP Expedition as a junior graduate student. Getting the chance to participate in such a high impact project (Expedition 337) was a fantastic experience and fundamental to my academic development. Having the opportunity to join the IODP T-Limit Expedition science party four years later, and to participate in such an exciting and most likely groundbreaking (literally!) project is a real honor and tremendously thrilling. I’m looking forward to share some it with you on this blog. Why now, why me, and why the Nankai Trough? The D/V Chikyu (science’s tallest ship) has been to the Nankai Trough several times and this time I want to go. But why is the Chikyu going back to the Nankai Trough and why would I want to go? For sure, geological elements have moved in the Nankai Trough since Ocean Drilling Program Leg 190 last visited in 2000, but not that much. What has really moved forward is the technology needed to measure and investigate the limits of deep life in the deep biosphere. Questions about what deep subseafloor biospheres do, and how they do it, and particularly the role of temperature have also developed. By rapidly transporting cores to facilities at Kochi, ultra-clean life detection experiments can be performed, whilst time-critical gas measurements will be performed shipboard. These new data will help address the bigger questions. A picture really does say a thousand words, and looks cooler too. Why would a rather old-fashioned (petroleum) organic geochemist like me want to spend 60 days at sea? Well the Chikyu and I have met before. But a get together for old time’s sake wouldn’t be reason enough. One of my current interests is using basin models to model deep biospheres over deep geological time. In geology-speak, a sedimentary basin is a place where sediment gets turned into sedimentary rock. These basins are geological places where exciting epoch-defining things happen, like a volcano or hot spring. This geological activity is not so obvious, though, and nobody “normal” goes on tours to sedimentary basins. 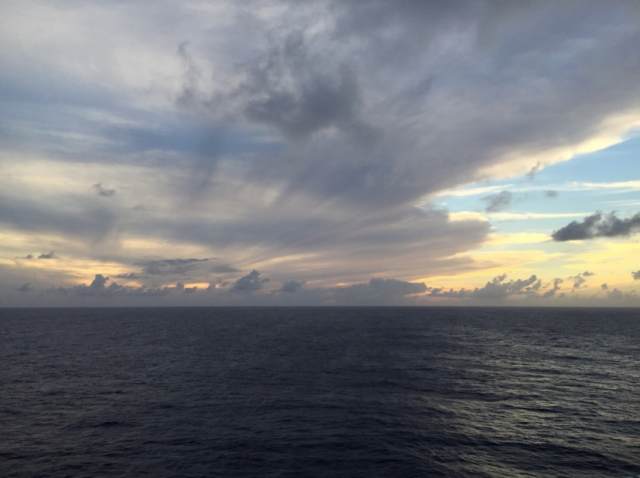 International Ocean Discovery Program (IODP) Expedition 370 will provide data against which I can ground-truth my models, and see if I really understand why and how microbes in some sedimentary formations thrive and why microbes in some formations don’t. The Nankai Trough is a complex place, so I will have to acquire some new data and solve other problems along the way…but more about that another time. The key point is that IODP expeditions provide my colleagues and me comprehensive data sets with levels of scientific control we could not acquire by any other means. 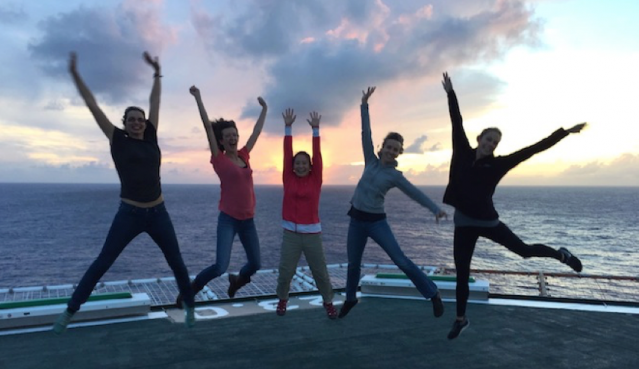 Clearly IODP Expedition 370 is exploring the frontiers of life. This type of exploration is self-evidently important for humankind; it makes our living and thinking capacities bigger and better. But for a scientist like me who works in a relatively applied field, it’s also really, really useful. I will save my thoughts on this for another day.